You may have seen our previous review of the Philips XL Digital Airfryer. Now we are going to take a look at another air fryer that has its own unique features… the T-fal ActiFry Gourmet. Read on! The T-fal FX7002 ActiFry Low-Fat Healthy Air Fryer – Gourmet Edition is an innovative small kitchen appliance that allows you to cook and fry foods with a minimum of oil. This produces a much healthier finished product than traditional deep frying. In this article, well go over what’s special about the T-fal ActiFry Gourmet and why you might find it to be the model of air fryer that suits your needs. We’ll cover things like how to use the T-fal ActiFry and how to clean it, as well as discuss the experiences of users. You’ll also find out what accessories are available and where to buy them, as well as where to find the best prices for the ActiFry. 1 What’s Interesting About the T-fal FZ7002 ActiFry? 2 What Do Other Reviews of the T-fal FZ7002 ActiFry Say? 3 How Do You Use the T-fal FZ7002 ActiFry? 10 How Does the ActiFry Gourmet Differentiate From the Other ActiFry Models? 11 What’s the Best Price for the T-fal ActiFry and Where Can I Buy It? What’s Interesting About the T-fal FZ7002 ActiFry? The T-fal FX7002 ActiFry cooks food evenly and efficiently, using a hot air circulation system with pulsing action. The Gourmet model uses 1450 watts of power, which is more powerful than the original or Classic ActiFry model. It has an elegant round design that comes only in black. The T-fal ActiFry features a window in the top for steam-free viewing of your food while it is cooking. It features a stirring paddle in the cooking bowl that circulates the food gently to create even cooking results. The removable cooking pan and the stirring paddle are ceramic-coated for non-stick cooking and an easy clean-up. The controls are very user-friendly and easy to understand. The device has an on/off button and a timer with a finish alarm. There are two buttons to open the unit, so you can do it with either hand or from either side. The cooking pan and the stirring paddle are completely removable to be placed in the dishwasher or hand-washed. There is a filter that is removable for washing. The T-fal ActiFry has a capacity of 2.2 lb of food, enabling you to cook for four people at one time. The outside is cool to the touch and won’t burn hands if touched. The T-fal ActiFry goes beyond the T-fal Deep Fryer. It can do more than just French fries and the foods you might typically expect to be deep-fried. It will also easily cook meat, fish, poultry, and even desserts. The Gourmet model comes with a dishwasher-safe measuring spoon and a full-color recipe book with 32 recipes. What Do Other Reviews of the T-fal FZ7002 ActiFry Say? The ActiFry Gourmet receives a very high percentage of positive reviews. Here’s what we’ve found that people are saying about it, the positive and the negative. The ActiFry is very well made and easy to use. Meals can be made quickly and efficiently in as little as 15 minutes’ cooking time, depending on what you cook. It allows you to cook food safely without checking it too often. Oil spatter stays inside the appliance, unlike traditional stovetop cooking. It is an innovative way of deep frying while using a very minimal amount of oil. Besides traditional cut fries, the ActiFry can do ribs, chicken wings, stir-fry, and lots of other things. Customer support for the product is very good. Works best with dense foods like meats, as softer foods can become mushy using the paddle. Coatings can come off when you use the paddle. Timer does not shut off the heat cycle. You must turn it off manually. Takes up a substantial amount of counter space. Fresh potatoes must be relatively dry or else they steam and become mushy. How Do You Use the T-fal FZ7002 ActiFry? The T-fal ActiFry has two buttons on the front. Either of them can be pushed to open the lid. Place your food directly into the circular cooking pan. If you are cooking smaller items that you want to be stirred, place the center paddle into the machine prior to putting in the food. If you are cooking larger items like fish or large pieces of chicken, leave out the center paddle. Then simply close the lid and start the timer for the appropriate amount of cooking time. When the timer alarm sounds, simply press the off button to stop the cooking cycle. When you are ready to clean up, the cooking pan and paddle can be removed completely and placed in the dishwasher or hand-washed. The non-stick ceramic coating makes food wipe off easily. The accessory measuring spoon is also dishwasher-safe. When the appliance has completely cooled, you may also wipe down the interior with a soft washcloth. The filter in the bottom can be removed on a periodic basis and placed in the dishwasher or hand-washed. How Does the ActiFry Gourmet Differentiate From the Other ActiFry Models? Besides the ActiFry Gourmet, T-fal has a variety of other models to suit different lifestyles. We have outlined the main differences for you. The main feature of the 2 in 1 is the double layer to cook two foods at one time. It also boasts an extra large capacity of 3.3 lb. This model is suitable for a busy cook who wants to make a complete meal in one appliance. The large capacity serves four people, and potentially more. This is the original model, also called the Eco model. It comes in both black and white color options. It has a cooking capacity of 2.2 lb and uses 1,400 watts of power. The timer does not turn off the cooking cycle. This is the budget model of the ActiFry. It has the same functionality as the other models but has a few fewer frills. It has a very small or no viewing window. It does not have a timer and will not auto-stop. The lid is not hinged, but instead lifts off. The unit starts and stops when the lid is removed. The model is suitable for a person looking to have the advantage of an air fryer appliance in their kitchen at a lower cost. The Express model features a much shorter cooking time due to the 1550 watts of power it draws. It has an extra large capacity of 3.3 lb and automatically shuts off at the end of the cooking cycle. The end-of-cycle alarm is quieter than in most models and the top viewing window is larger. This model is suitable for busy cooks who need to complete their cooking activities quickly. This model has an extra large capacity of 3.3 lb but still uses only 1,400 watts, like the Classic model. It only has one button to open the lid, possibly eliminating the confusion of two buttons that do the same thing. It comes with a collar for retaining food when the lid is opened. It boasts the largest recipe book of all the models. The timer will end the cooking cycle on this model. It cannot, however, be used with the Snacking Basket accessory, due to the configuration of the cooking pan. This model is suitable for families and those cooking for a large number of people. This model has a smaller profile and footprint and a corresponding smaller capacity of 1.3 lb of food. Because it is smaller, it has faster cooking times than the Classic or Gourmet models, even though it uses only 1,200 watts of power. The timer will stop the cooking cycle, and it comes with a collar to retain food when the appliance is opened. This model is suitable for couples and people cooking small amounts of food at one time. This is the larger version of the Classic model. It has a 2.6 lb capacity and is available in black and white. It also comes with a collar to retain food when the appliance is opened, but the timer does not stop the cooking cycle. It is suitable for a wide variety of cooking lifestyles, but particularly those that need to cook for a group of four people or more. This is basically the same model as the Classic, but it comes with a removable wire basket for cooking fragile food items that are not paddle-safe. It may not be available in North America, but the Snacking Accessory basket is available for all models except the Family Sized. 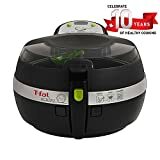 What’s the Best Price for the T-fal ActiFry and Where Can I Buy It? The ActiFry Gourmet air fryer can be expected to cost between $150 and $200. You can usually find the current and best price for your ActiFry Gourmet on Amazon. Click here to check on Amazon. Accessories are available for your T-fal ActiFry at the manufacturer’s website or here at Amazon.com. With so many air fryers out there, you may be wondering if this is the brand for you. The T-fal ActiFry has been around for a long time, with the original Classic model being released in France in 2006. The Gourmet has a slightly higher power rating than the original and compares favorably with its competition outside the brand. The ActiFry Gourmet comes only in black, so if that doesn’t suit your kitchen, you can try a different ActiFry model that does. The T-fal ActiFry holds up to the competition with the removable paddle feature that stirs the food for complete cooking. It is favorably priced, lower than most of the competition, and if the Gourmet is not right for you, there are a number of models and sizes that may be more suitable. The ActiFry is an ideal appliance for families with small children due to the inherent safety of the enclosed cooking design and the general efficiency of cooking. For this reason, it seems like it would also be great for a college student in a dorm. Overall, it is an elegant appliance that will not only look well in the modern kitchen, but will also prepare foods quickly, efficiently, and in a healthier manner. If you agree that the T-fal ActiFry Gourmet is the right air fryer for you, we encourage you to check it out.